In Memphis, Sami, Marlena and John demand answers about whether or not Will is alive. Conflicted Paul makes a surprising decision about Will. Chad offers Abigail a job. Tripp interrupts a secretive meeting between Kate and Theo. Eve has another unexpected revelation for Victor and Brady. Eric and Brady have a tense run-in. Kate presents Gabi with a lucrative opportunity. Eli and Rafe clash on their first day as partners at the PD. Congratulations to Days of our Lives on their 52nd anniversary! Gabi tells Chad and Abigail they could be working together. Eve denies murdering Deimos as Brady tells Rafe and Eli he has proof. Kate is intrigued when she overhears a private conversation between Kayla and Steve. Theo’s plan to help Claire backfires. Sami has a surprising request for Rafe. Eve desperately tries to extricate herself from Brady’s trap. Chad confronts Andre about sabotaging the company. Chloe tries to get Lucas to stop drowning his sorrows. Rafe and Sami get shocking news about Will. Tripp confides his growing affection for Claire to Steve. A tragic shooting occurs. JJ’s going to live out a cop’s worst nightmare that has a ripple effect on the town. 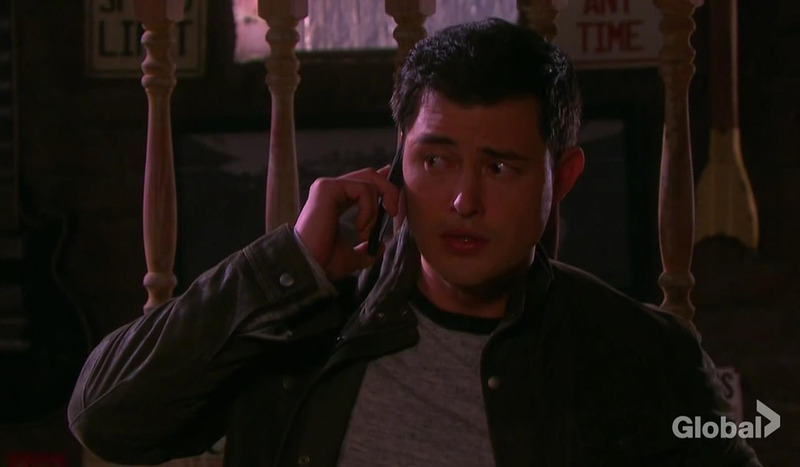 Paul makes a confession to Sonny. Sonny and Sami find Will! Sami and Sonny are stunned by Will’s revelation. As Chad rips into Andre, Kate tries to cover her tracks. Valerie makes a difficult confession to Abe. Paul confides in John about his deception. Marlena tries to get through to Will. Sonny sees Will but WIll doesn’t recognize Sonny. Sonny tries to jog his estranged husband’s mind with a kiss but Will shoves him away. After Will hears from everyone about who he is, he runs away. Arianna’s name sparks something in Will, so Sonny feels there is hope. Brady and Eve face off. Hope is upset with Rafe. Chad receives devastating news and blames Andre for it. It’s not necessarily Sonny or Sami who see Will first in Memphis. Eve reveals she’s Mrs. Deimos Kiriakis. She’ll be a “real headache” for Victor, Maggie, and Brady. There’s “some outside interloper” who is one step ahead of Kate in sabotaging DiMera. Andre’s the big suspect currently. Steve and Kayla come in direct conflict with Kate. Chloe and Lucas possibly could connect on a deeper level than friendship. Ron C wanted to keep Gabi “in the DiMera orbit” though Chad has made his choice and is in love with Abigail. Abby and Gabi are trying to move beyond the unease. Find late-breaking Days of our Lives news, and who is coming and going on Days of our Lives.